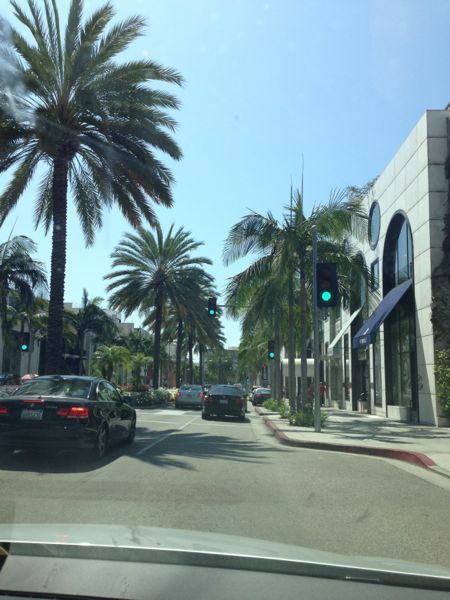 Like the movies have us believe, LA has palm trees. And also, plentiful sunshine, expensive cars, clothing, houses, children’s furniture stores–oh, the list goes on! We said “good-bye” to Helen this morning and descended from Hollywood Hills via Mulholland Drive, Rodeo Drive, and Wiltshire Drive. It was a feast for the eyes, that’s for sure. …which is why I am delighted to share with you that we found a new house(s)!!!! 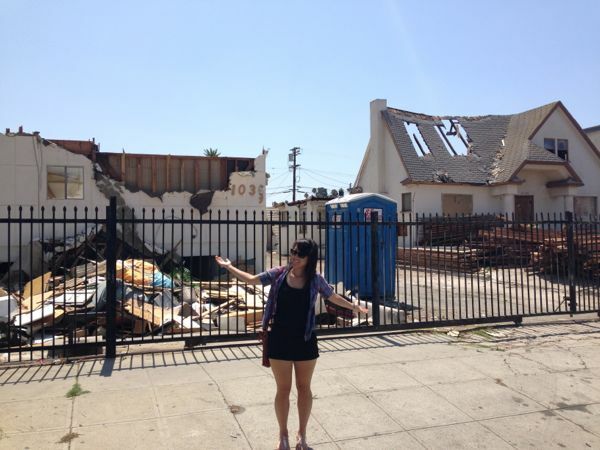 Yes, yes, we’ve decided to move into BOTH of these two adjacent homes in the heart of Korea town! This zip code isn’t quite as flashy at Beverly Hills, but, you know, our new home boasts a luxurious outdoor bathroom and impressive sunroofs in all rooms. And when we move into the neighborhood, property value is certain to increase. We’re such trendsetters; this will be 2013’s most expensive US zip code, for sure. Okay, so we didn’t find a home in LA (HAHAHA, like you fell for that! 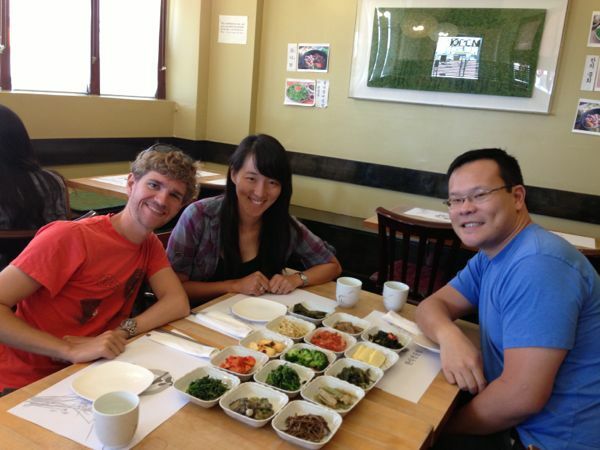 ), but we did find Chris Choi! 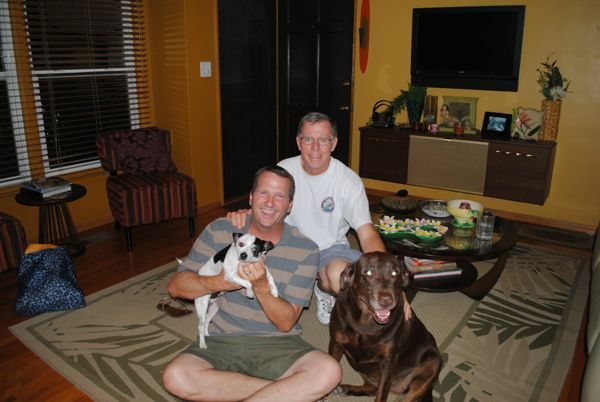 We met Chris through Dan and Alejandro while he was studying in law school at UofI. As it turns out, he just flew into LA from Washington, D.C. yesterday and wanted to meet up with us. What a serendipitous meet-up! 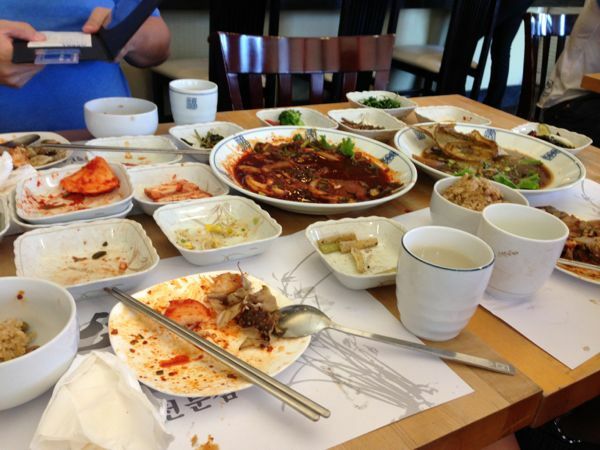 Soban gives you tonnnnnnns of banchan (side dishes). BANCHAN EXPLOSION! I’d say we did a pretty good job though…. 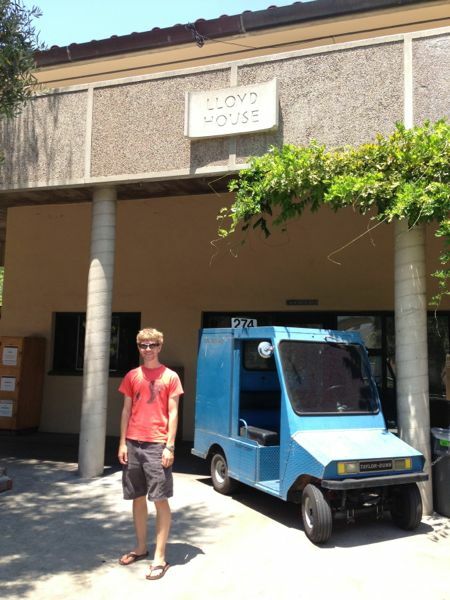 After lunch, Harrison wanted to revisit the CalTech campus, which, contrary to the impression you may have from this blog, is actually his one true love. After spending his first “independent” summer there in high school (He says: nominally, doing research but in reality, being payed to play pool and hang out with awesome people), he has talked about it with a sort of dreamy, drunk-on-nostalgia voice for the ten years that we’ve been together. So yeah, I was expecting a lot! It is a very pretty campus. 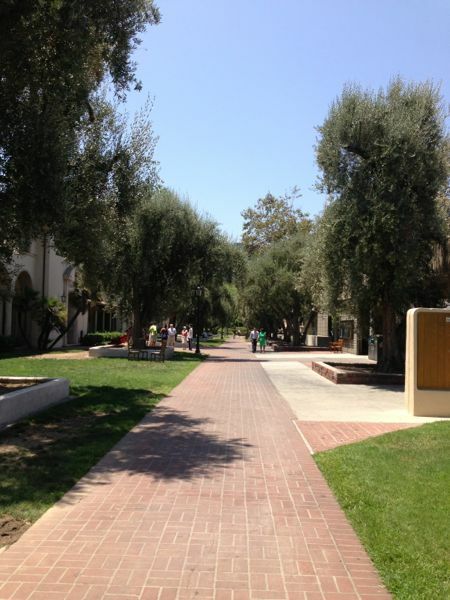 I mean, there are olive trees lining the quad with the dormitories. 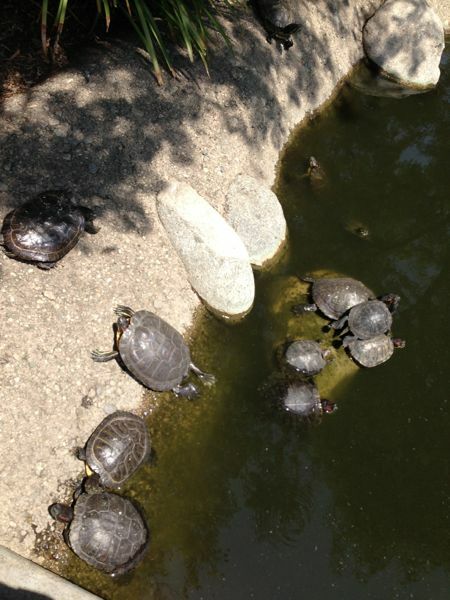 He somehow neglected to tell me that THERE ARE TURTLES IN A CAMPUS POND! This is clearly the best part. World-class academics ain’t got nothing on turtles. After the turtles, it was all downhill. I got the post-lunch sleepies and fell asleep in the car until we reached the outskirts of San Diego. We’re staying in downtown San Diego at the swanky Omni, which is a very generous wedding gift from my (and now, Harrison’s!) cousin Trent and his husband Rick! I visited their lovely home in the hills five years ago for a family reunion, and I was pumped to go back and see them and to eat Trent’s homemade Mexican food! 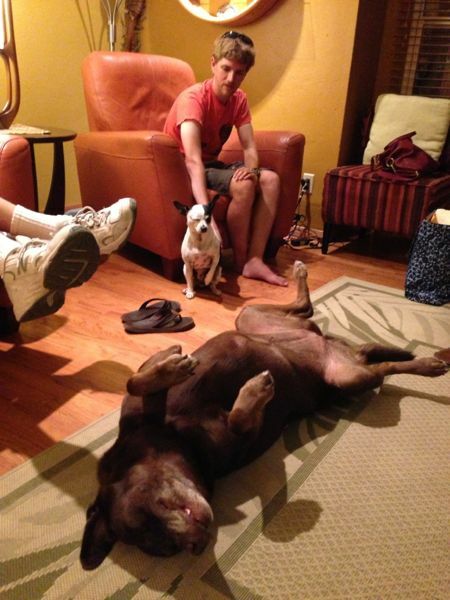 The house has gotten even better–they now have two great dogs, Ellie (chihuahua) and Sarah (lab)! Meanwhile, Sarah listened to our conversation with great dignity! Rick is a San Diego native, and Trent has lived here for 25 years. They had lots of great things to say about the city, and their arguments about the weather were pretty convincing (“We own some hoodies. That’s about it.”). 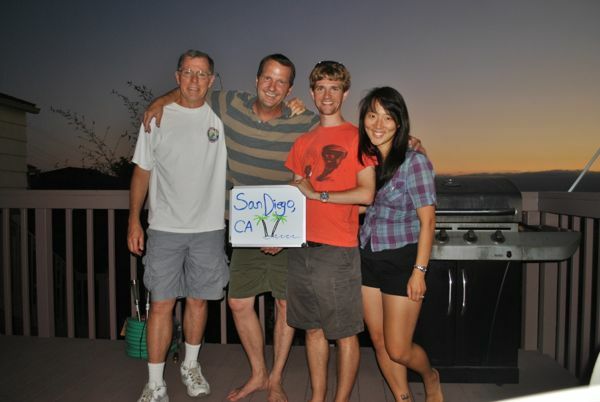 → Day 43: Seeing the Pacific Ocean & Dorothy! So glad you got to see Trent and Rick! So much fun to be around! Sarah fits right in! My experience with Cal Tech is that they give their undergrads tens of thousands of dollars to throw parties. They have to prod them to socialize! While visiting as a potential grad student, I went to one of those parties and consumed a lot of the tequila. I don’t remember much else. Is that where you lost your taste for it? We enjoyed visiting with you both, as did the girls! We can convert Rick’s man cave into your room! Ha, I’m not sure how Rick or the displaced GI Joes would feel about this. I didn’t know what a tweeker was… but I have known some… sadly! Trent and Rick seem like they would be so fun to talk to!